In these next four pages I'm going to explain the process I used to save a couple pieces of wood that were key pieces to the floor restoration part of my Rickenbacker. These pieces of wood, which you'll see on the next page, had the common old wood problems. Some dry rot, and a bug problem. These are two different problems with two different process to rid your wood of their problems. 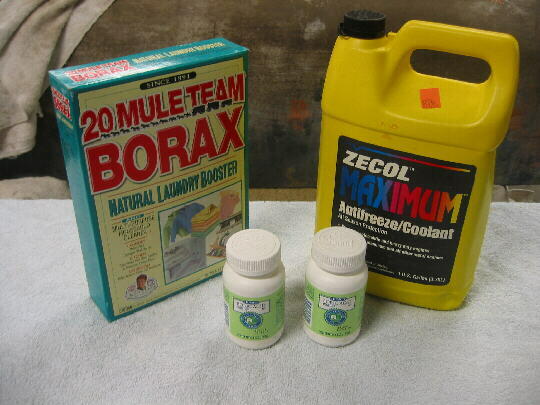 The picture to the left is the main ingredients needed to rid your wood of it's rot problem. Before I start I should state I did my research on these problems first before doing my repairs. I first went to the guy I'm buying all my wood from. Been in the business 22 years. New right away all my problems and told me I first must treat the wood for the rot, then cook the wood to remove any bugs that might still be alive. He told me to look for rot repair stuff at local paint store or wood boat repair places. The local paint stores were clueless, and in Iowa we don't have many wooden boats. So I turned to the all might web and found this site: http://www.acbs-bslol.com/Gadgets/D97WoodRot.htm The next couple pages I will be following the process outlined on this page. The direction state to measure all items by weight, so I'm using a small postage scale set up to measure in ounces. 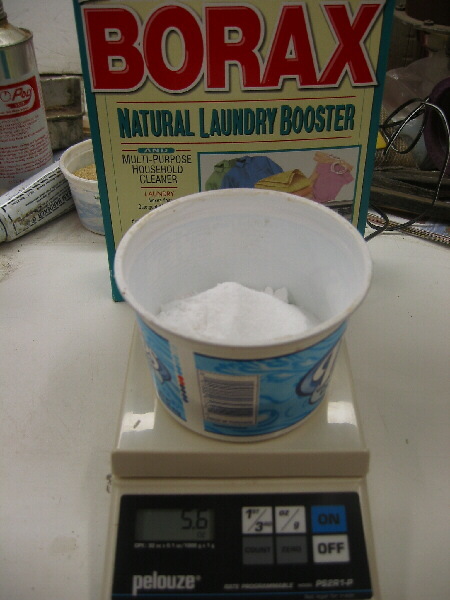 To make a 40oz mixture the ounces needed are as followed. 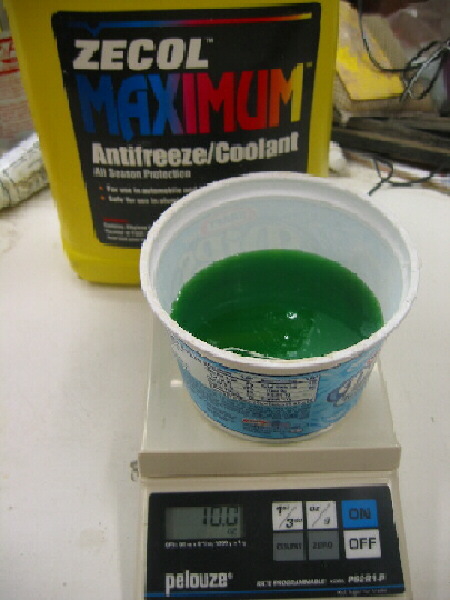 Here I'm measuring out my Antifreeze. Antifreeze is used because it's made with glycol, very important to buy antifreeze made from glycol.....why...because that's what the recipe calls for. The website explains why in better details. Okay now I need to bring this magic mix of items to a boil. This is to remove any water that might be in the solution. The instruction state to bring the solution to a boil, which isn't 212 degrees since there isn't any water in this...that's what were trying to get rid of. The boiling point of this magic brew is around 250 degrees, and the instructions call out to take it up to 260 degrees. Using a candy thermometer I was able to watch the temperature. Don't use the wife's candy thermometer...very important!!! If you do I'd advise not putting it back in the drawer where you found it. I'm using a 1 1/2 quart size pan on a small electric burner in my shop. Again not recommended to use the wifes pans for this project. 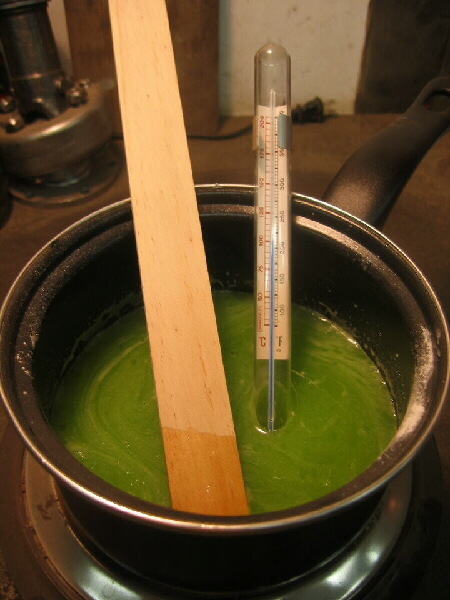 Also note the stir stick doesn't show any green tint from the mixture. If for some reason you'd want to clear over this afterwards I'd believe you should see much of a green tint, if any.